Homepage of Supervac specialized in Vacuum trucks; Vacuum excavators, Industrial vacuum trucks, sewer cleaners, hydro excavators and other vacuum equipments. In the construction field, our hydro and air excavators are mainly used to aspirate materials of all kinds both liquid and solid. They are used particularly when digging trenches and holes for poles (polarization) and for digging in hazardous or restricted environments. 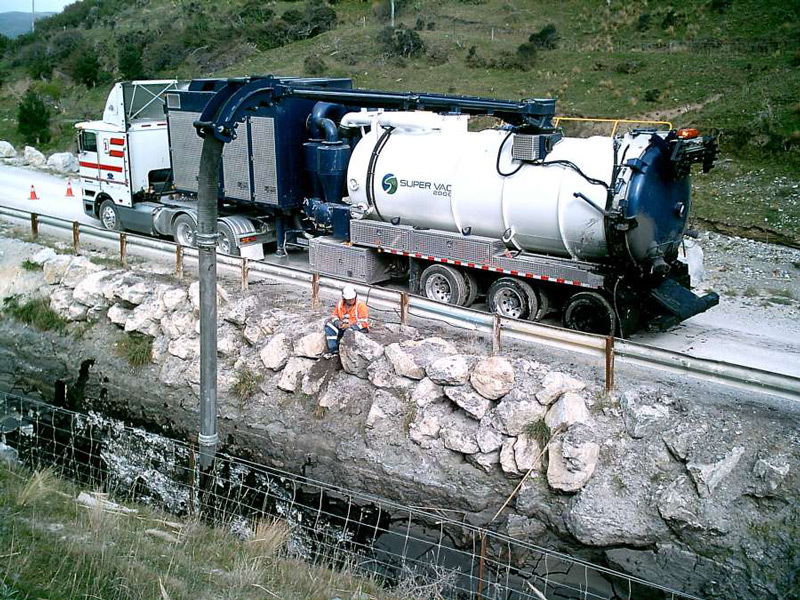 We propose two alternatives: hydro-excavation or air-excavation. Hydro-excavation is a digging technique from 3,000 PSI to 6,000 PSI, using water at ambient temperature or heated with a burner of more than 800,000 BTU. One of the strengths of our equipment is our insulated and heated cabs which allows us to work at temperatures -40oC. This technique is extremely efficient and fast, even in frozen ground. Air-excavation offers an air jet, without water. Thus, the collected material is dry and can be reused on site rather than having to be relayed to a deposit of liquid materials. Air-excavation is generally used in less compact soil. A major asset to using air-excavation is that water supply is not required to perform the digging. Our vacuum trucks are well known for their robust and durable design, thanks to their quality of assembly in thicker steel. Our combined expertise and the design of our units make them easily adaptable for industrial applications or for the transport of hazardous materials. Thanks to their centralized electronic systems and user-friendly interfaces, our units are very easy to use. Thanks to its heat exchanger for the water circulation, make the most of your hydro-excavator over 12 work-months, even the winter. Choose between stainless or steel tanks, according to your needs. Supervac can safely respond to the hazardous materials transportation standards required by the US DOT (Department of Transportation) or TC (Transport Canada). Supervac’s vacuum units, for wet or dry waste, combine robustness and performance. Hydro-Excavation is digging safely with high pressure water and vacuum. Discover the best equipment on the market, the Supervac hydro-excavators. Supervac, your expert in the fabrication of vacuum and specialized custom built equipment. © 2019 Supervac. All rights reserved.